Explore the distinctive meta-luxury with this luminous objet. Designed by Barlas Baylar, The Valiant chandelier is unequivocal representation of superior craftsmanship with hand blown Murano glass lamps and solid polished bronze details. 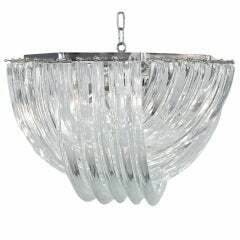 Stainless steel option on the statement of the chandelier is also available. 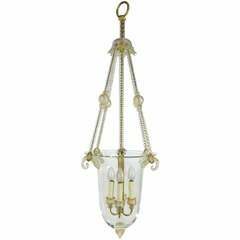 Fantastic Murano glass lantern of clear crystal with Cordonato D'oro decoration by Barovier & Toso. Dieser stilvolle Barovier et Toso Murano Glaslüster stammt aus den 1930er Jahren und wurde von einem Anwesen in Palm Beach erworben.